Chinese leaders are crazy. They actually think that by sinking two U.S. aircraft carriers it will give them total control of the China Sea. It will start a war! Beijing announced its intention saying it had activated the ship killer ballistic missile system. The attack system was introduced in April 2018. China seems to be trigger happy to use it. Deployment is intended to strike vessels passing through the East and China sea. The belief that it can do this with impunity is misplaced. There will definitely be a military response. Two U.S. aircraft carriers have just passed though the disputed region. They are operating under the international rules of the sea which allows free passage of any vessel from any country needing to travel through the area. The American vessels ignored the warnings and threat of Chinese aircraft and warships sent to send them away. Trump has no patience. It seems the Chinese leadership has a patience problem as well. They will have to curb their impetuosity. Though the U.S. is outspoken about most things, it keeps its new military hardware very secret indeed. Ballistic is old hat. One can be sure that the Americans have something much better. Having truck-mounted weapons is very "North Korea". The U.S. will just wipe out fixed Chinese military bases in retaliation. 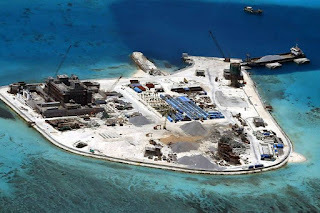 The gradual expansion Chinese power South China Sea has caused great alarm. However, should less alarming looming prospect trade war, United States fighting alone. John Quiggin. A recent near-collision Chinese U.S. Navy destroyers has focused new attention potential conflict South China Sea led cancellation visit China Defense Secretary Jim Mattis. China’s naval expansion South China Sea puts position control sea lanes used transport trillions dollars worth goods year, accounting third world merchandise trade. China has militarized islands claimed Sea its own territorial waters, basis flimsy historical claims routinely denounced U.S. naval operations region illegal provocations. Unsurprisingly, response Chinese assertiveness much foreign policy community has been demand similarly assertive response United States. For example, Robert Kagan has argued United States must resist extension Chinese sphere influence its immediate vicinity. A realist perspective suggests more cautious approach, more careful analysis economic issues. A rational assessment suggests China has far more stake issue United States.crucial, but commonly neglected, fact trade flowing South China Sea great majority trade flows China. That makes control South China Sea crucial national interest China, hostile power potentially choke off imports exports. But obviously, China has interest disrupting its own trade. By contrast, direct interest United States abstract principle freedom naval operations. Moreover, U.S. military far more powerful global terms, balance forces much more even regional terms. Conflict powers comparable strength generally resolved favor side greater commitment.South China Sea important U.S. allies including Japan Korea, part cheapest route importing oil resources. It not, however, route. It has been estimated diverting imports cost $600 million year Japan, $270 million year South Korea. That’s lot money. But compared potential cost Trump administration’s trade policy, it’s trivial.United States imports $40 billion cars Japan $10 billion Korea.2 percent tariff now consideration, would cost Japan $10 billion year Korea would cost Japan $10 billion a year and Korea $2.5 billion. So. billion. So, we strange position United States deploying massive naval forces deter purely hypothetical threat its Asian partners allies, making actual threats impose much greater economic damage partners allies. Similar points may made Trump’s administration withdrawal proposed Trans-Pacific Partnership. From viewpoint Obama administration, pushed deal, central geopolitical rationale set economic structure marginalized China. Trump’s decision pull would have made sense part rapprochement China. However, administration’s trade policy has effectively put allies rivals same camp.